On Thursday 22 November, Glenside Hospital Museum and Milk Poetry hosted a charity poetry evening to raise money for Bristol Mind. The aim of the evening was to use poetry to explore mental health in keeping with the museum’s ethos of destigmatising mental illness and promoting awareness and understanding. The evening welcomed a host of poets including Beth Calverley (pictured), Tom Denbigh and Sam Grudgings from Bristol’s Milk Poetry, Callum Wensley and Josie Alford (pictured) from Bristol’s Hammer and Tongue as well as Bath poets Pascal Vine, Claire Guest and Connor Macleod and offered guests the opportunity to explore the museum’s wide range of exhibits. 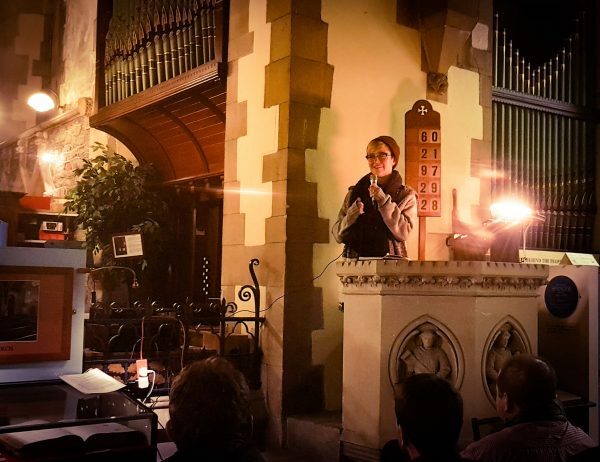 It was a beautiful atmosphere, with poets reading from the church’s pulpit, much to the delight of the 30 or so guests, raising £200 for Bristol Mind in the process.